Nearly five years ago, Barry Lyster was living and breathing in the world of professional cycling. He owned and managed Local Ride Bike Shop, as well as organized a number of professional races in the Lower Mainland. With over 20 years of cycling involvement in various capacities mirrored by a fierce adoration for the sport, Lyster had seen it all. But even with years of experience, there are some things that you don’t see coming. Nearly five years ago, Lyster experienced the tragic loss of his friend, Jeremy Storie, who died by suicide. Storie was a well-known and respected coach in the Canadian cycling scene. His larger than life personality and tenacious, attacking style of racing allowed him to foster some of Canada’s most successful international riders. The bronze medal captured by the Canadian women's cycling team pursuit at the London 2012 Olympics can be traced back to Storie's relentless passion to develop gender equality within the sport. It was only three months prior to his death that Storie began coaching Lyster’s daughter, Maggie. After coming to terms with his death, Lyster took up the reins of Storie’s legacy to foster youth and female cyclists. In addition to coaching Maggie, Lyster currently coaches and directs TaG Cycling Race Team, a high-performance junior and women’s cycling team based out of North Vancouver. A degree in Human Kinetics with a coaching focus, along with numerous NCCP courses under his belt, allowed Lyster to make a seamless transition. To this day, Lyster continues to further his coaching capacity through NCCP courses and knowledge sharing with other coaches. He also accredits PacificSport Fraser Valley for coach funding, gym access, and strength training programs that have made it possible for his young athletes to thrive. Paired with his passion for the sport, Lyster finds coaching to be extremely gratifying, especially when his athletes rise above and go beyond their capabilities. “It’s rewarding when you see them compete at a high level, try something outside of their comfort zone, fail in the moment, but learn from it and come back stronger,” he says. Lyster had the opportunity to witness his own daughter pull herself up from the ashes at the 2016 Junior Track World Championships in Switzerland where she competed as a first year junior in the Omnium, a six event race. In the very first race, she was taken out by a crash by another rider just before the finish line. With both body and bike flying through the air, Lyster could only watch aghast from the sidelines. “On the sidelines we’re going, ‘Is this it? Is she done from the race’? 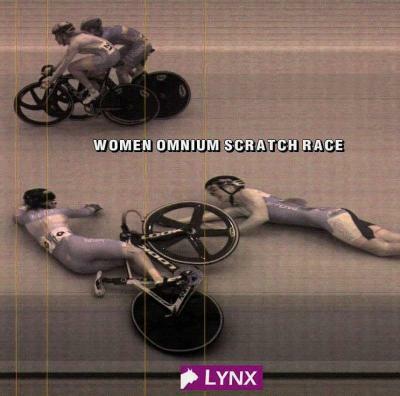 They had a photo finish camera and there’s this amazing shot of her and the bike in midair, going past the line. Had she been a few feet back, she wouldn’t have gotten the points and wouldn’t have been in the medal hunt. It was that one moment that everything could have gone south, and it all came together," Lyster says. Still eligible to compete, Maggie ended up receiving a bronze from last year’s championships. At this year’s Junior World Track Championships, she emerged victorious as a world champion with both gold and silver medals, and the prestigious rainbow stripes. Given Maggie’s success in cycling, it’s no wonder that Lyster was awarded Cycling Canada’s Recognition Award for Coach of the Year in track cycling this past year. When asked to provide advice for current and aspiring coaches, Lyster focuses on the importance of incorporating variety. “Don’t get hooked on the numbers. In cycling, power numbers are dominating our sport. They’re dominating training plans, race plans and are in the heads of athletes. They’re starting to objectify these numbers. Although the numbers do provide valuable data for us to use as coaches, try to incorporate old-school coaching techniques. Better yet, create new ways outside of the numbers to accomplish your training plans," advises Lyster. Inevitably, much of Lyster’s coaching philosophy was influenced by his late friend, Storie. Although he is no longer with the cycling community, Storie’s legacy continues everyday with passionate individuals such as Lyster who strive to further develop cycling for his junior and women’s cycling team. Sport is not defined by one type of person or one kind of activity. Sport, in all its manifestations, represents a spectrum of people, abilities, languages, and values. The viaSport I AM SPORT Series is a monthly feature showcasing the myriad of individuals that personify sport in B.C.